Already at that time, Huschert produced image films on 35 mm for the screening in the cinema and big events on his own. For the films (some of them were created at home), he received more than 200 awards in Germany and worldwide. In the years before, he was honored with 20 Federal Economic Film Awards from the German Ministry of Economics for various image films. In order to increase the quality of the TOURISM films, he then launched the competition “The Golden City Gate” in 2001. 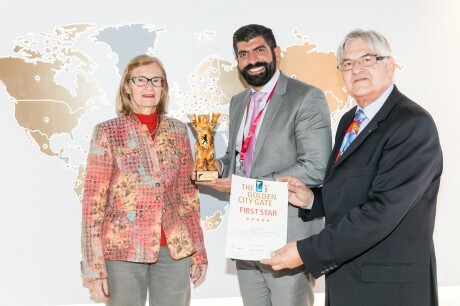 He hereby would like to point out that “The Golden City Gate” is a creative cinematic tourism competition for countries, cities hotels and regions and that the competition is not a film-festival. For Huschert, the focus always lays on the emotion and the implementation of the film. 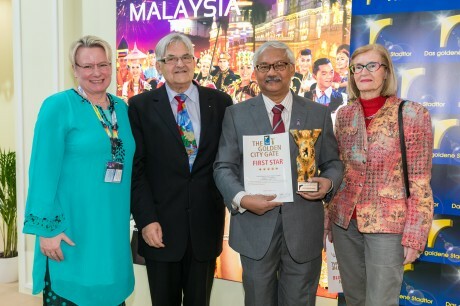 In 2001, the first competition started with 5 films from 3 countries as a niche during ITB Berlin. Till now, the competition received and evaluated appr. 1,890 tourist entries from 43 countries as well as from CNN, Deutsche Welle, BBC, DM SAT and even National Geographic. It´s participants come from countries like China, Thailand Taiwan, Sri Lankan, Peru, Africa, Mongolia, Austria, Switzerland, Germany and many more. Cities such as Singapore, Munich, Mainz, Worms, Berlin, India, Hong Kong etc. also took part in the competition. Hotels like the Steigenberger Hotel Group, Kempinski Hotels, Langham Hotels, Dorint Hotels, Hotel Erbprinz, like to participate with their new films just to name a few and even Airlines and cruise lines, such as Eurowings, Srilankan Airlines, the MS Deutschland and AIDA, have also successfully competed with the car rental service SIXT. Around 40-45 jurors will have the responsibility to rate the submitted films and find the best film in each category with a strong scoring system. The system shows, whether the contributions were reaching the desired target group of the marketing managers of the destinations, cities and hotels. The scoring system gives creators and clients the ability to identify weaknesses and strengths of their contributions, which can be discussed in detail after the competition. The jury consists of a big variety of film- and tourism experts who were carefully preselected for the jury session. For example Vice President Susanne Schick DRV, Dr. Ing. Hans Dietrich Winkhaus, CEO Henkel, David Ruetz ITB-Berlin (TBC), Michael Oelmann, publisher German Economy Television, Timo Feuerbach, Managing Director EVVC, Prof. Monika and Helfried Hagenberg Communication Design, Ralf G. Neumann Managing Director former BBDO; Joachim Fischer, Editor-in-Chief Tourism Insider, Prof. Hans-Joachim Berndt, Filmhaus Berlin, and Hagen Richter, Instagram Influencer. Many other personalities can be found on our website. Minister Brigitte Zypries and Annegret Kramp – Karrenbauer have also been interested in the jury in recent years and have been invited to the jury this year too. And we also won´t forget the Honorary President Regine SIXT “. Wolfgang Jo Huschert: “Right now, 21 interesting and a few new countries have registered for the competition. Among them are countries and hotel groups that have never participated in “The Golden City Gate” yet.” Due to the fact that the International Club can only host appr. 100 persons with seats, a pre-registration is necessary for the award ceremony. Therefore please register by email: info@huschert.de.